Nicholas Oberling's work has been exhibited at the C. M. Russell Museum and is in the permanent collection of the Hockaday Museum of Art. He is a founding member of the Montana Painters Alliance. He has been a selected Quick Draw artist and participant at the C. M. Russell Museum's Auction of Western Art, the Whitefish Community Foundation and the Montana Land Reliance and Treasure State Art Auctions. He has been Artist in Residence at Glacier National Park and the Helena National Forest. He conceived and organized the Big Hole River in Paint fundraiser, which has had regional and national exposure. He has been a Top 100 finalist at the Art for the Parks competition. He has been a participant in the C. M. Russell Museum's auction of miniatures. His work has been featured in shows at the Hockaday Museum of Art in Kalispell, CM Russell Museum, and at the Paris Gibson Square Museum of Art in Great Falls and the Holter Museum in Helena. He has participated in Masters in Montana; invitational auctions on behalf the Hockaday Museum of Art; the Yellowstone Art Museum; and the Nature Conservancy of Montana. 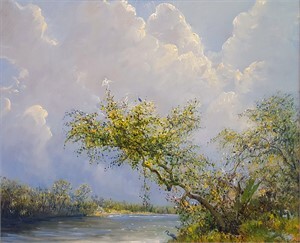 He was recipient of the Montana Arts Council's Visual Arts Fellowship Grant, 2000, as well as recipient of the Junius Allen Memorial Award, the Henry Nordhausen Memorial Award, the George Inness Jr. Salmagundi Club of New York Award, the Philip Isenberg Award, and the Arthur T. Hill Memorial Award. His work has been featured in Western Art Collector Magazine and a painting of his was selected for the April 12th cover of Dan's Papers. Nicholas Oberling was educated at Cornell University and studied painting under the atelier system at The Art Students League of New York for a decade. He is an active volunteer in promoting youth art education.